Cummins Inc., one of the world’s major truck engine developers and a giant in the heavy-duty diesel arena, is looking to electric power as it plans strategy for the future. Cummins unveiled its electric drive system – with an optional for a clean diesel engine serving as a range-extending generator – during a “next-generation” technologies showcase at its Columbus, Ind., technical center Tuesday. The powertrain was installed in prototype Class 7 “urban hauler” electric tractor built by Roush Enterprises. The electric truck would be aimed at the local freight delivery and drayage markets. 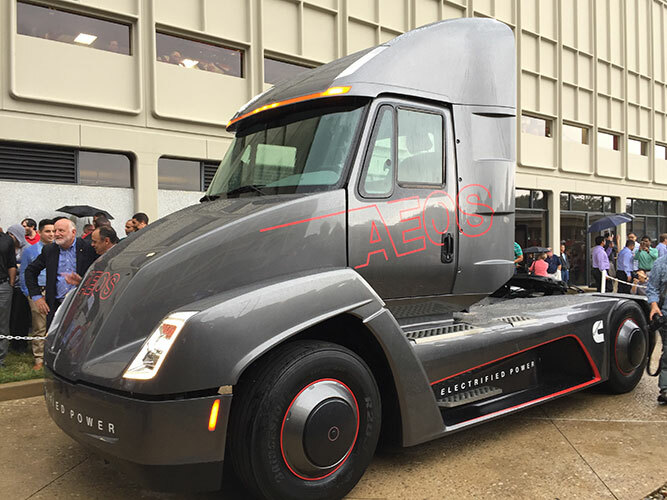 Because of its size and standing in the trucking industry, Cummins’ venture into electrification is “very significant,” said John Boesel, chief executive of Pasadena-based clean transportation incubator Calstart. The company’s effort underscores growing industry acceptance of electric power. “Cummins is making a smart move by diversifying its powertrain portfolio,” Boesel said. While the truck is a prototype, Cummins said in June that by 2019 it will be building electric powertrains for the transit bus market. And buses will just be the start. The company intends to bring electrified powertrains into all of its product lines as market conditions dictate, said Julie Ferber, chief of Cummins’ electrification program. 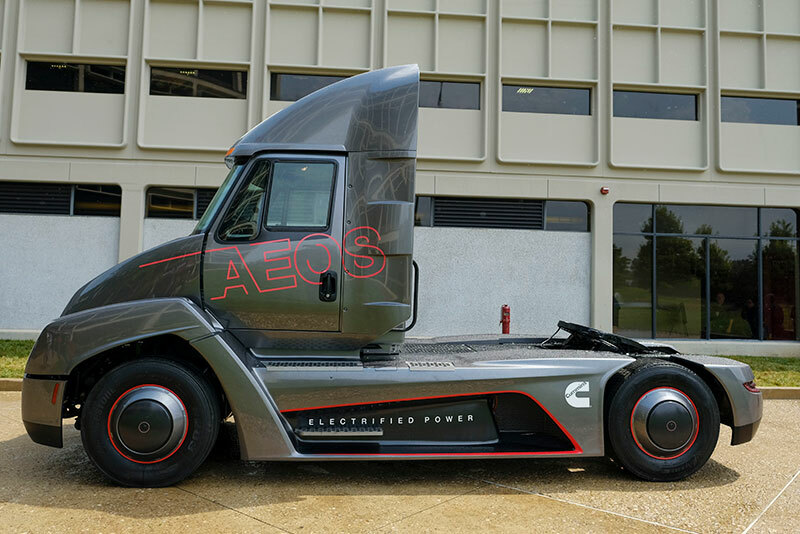 The prototype truck’s 140-kiloWatt-hour lithium-ion battery pack could provide up to 100 miles of range on a single charge. Adding extra batteries could increase all-electric range to 300 miles, and the optional range-extending diesel engine-generator could add an additional 500 miles of range. The electric truck’s efficiency is equivalent to 30 miles per gallon for a standard diesel Class 7 truck, according to Cummins. The drive to provide electric powertrains for trucks is rooted in regional and national efforts to reduce diesel truck emissions. California is a particularly strong proponent of electric trucks and is home to numerous manufacturers and demonstration projects. Transportation produces almost a third of all greenhouse gas emissions in the U.S. and trucking is the segment’s second largest source, according to the federal Environmental Protection Agency. Cummins powertrain technologies, including battery-electric systems, will enable it to respond “to changes shaped by the regulatory environment and global concern for air quality and the need for a low-carbon future,” Jennifer Rumsey, the company’s chief technical officer, told Trucks.com. Calstart, which promotes all types of emissions-reducing technologies and fuels, sees electric trucks in the heavier Class 7 and 8 categories as a slow-growing but important addition to the clean transportation arsenal. “We see significant potential applications for a zero emissions tractor, both in Class 7 and 8 configurations,” said Bill Van Amburg, Calstart’s executive vice president and head of truck programs. Cummins’ use of a low-emissions internal combustion engine-generator to augment an electric truck’s batteries and provide extended range “is one of the technology architectures we’ve specifically identified as having a business case,” said Van Amburg. He cited a recent Calstart study of the commercial potential for low- and zero-emissions trucks in urban distribution centers and the ports of Los Angeles and Long Beach, which handle nearly 40 percent of all shipping freight entering the U.S.
Cummins also said that it continues to work on hydrogen fuel-cell development, on bio-fuels and synthetic fuels and is developing an advanced spark-ignited engine that can deliver diesel performance using a range of liquid fuels including gasoline, ethanol and methanol. “Energy diversity is key to the future and a one-size fits all approach is not viable,” Rumsey said. While Cummins is early to the game with a completed all-electric heavy truck prototype, it isn’t the first: Peterbilt unveiled a prototype Class 8 battery-electric refuse truck earlier this year, Wrightspeed has been installing its range-extended electric powertrain in Class 8 refuse trucks since late 2016, Motiv Power Systems builds scalable electric powertrains for numerous commercial applications including refuse and delivery trucks, Orange EV builds heavy-duty electric drayage tractors for port and terminal applications and BYD builds Class 5 through Class 8 battery-electric vans and trucks. Additionally, Tesla Inc. has been developing a battery-electric Class 8 long-haul truck that it plans to unveil on Sept. 28; Nikola Motor Co. is developing a Class 8, long-haul truck powered by a hydrogen fuel-cell electric powertrain, and Toyota Motor Co. recently unveiled a working prototype fuel-cell electric Class 8 drayage truck it is testing at the Port of Los Angeles. Daimler, a major heavy truck builder whose brands include Freightliner and Fuso, said last month that it plans an all-electric “Urban E-Truck” capable of hauling up to 26 metric tons. Fuso – which operates as Mitsubishi-Fuso in the U.S. – also plans to unveil a production all-electric urban delivery truck, the medium-duty eCanter, for the U.S. market at an Sept. 14 event in New York.